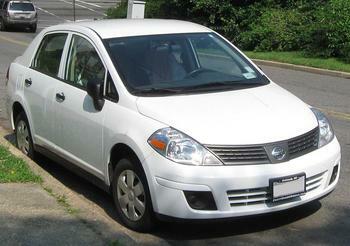 Nissan North America is recalling 233 model year 2007-2008 Nissan Versa sedans and hatchbacks originally sold, or ever registered, in Alabama, Arizona, Arkansas, California, Delaware, District of Columbia, Florida, Georgia, Hawaii, Illinois, Indiana, Kansas, Kentucky, Louisiana, Maryland, Mississippi, Missouri, Nebraska, Nevada, New Jersey, New Mexico, North Carolina, Ohio, Oklahoma, Pennsylvania, South Carolina, Tennessee, Texas, Virginia, West Virginia, Puerto Rico, American Samoa, Guam, the Northern Mariana Islands (Saipan), and the U.S. Virgin Islands. The passenger airbag inflators may explode due to propellant degradation due to exposure to humidity and temperature cycling. An exploding inflator may result in metal fragments striking the vehicle occupants resulting in serious injury or death. Nissan will notify owners, and dealers will replace the passenger front airbag inflator, free of charge. The recall began July 25, 2018. Owners may contact Nissan customer service at 1-800-867-7669.